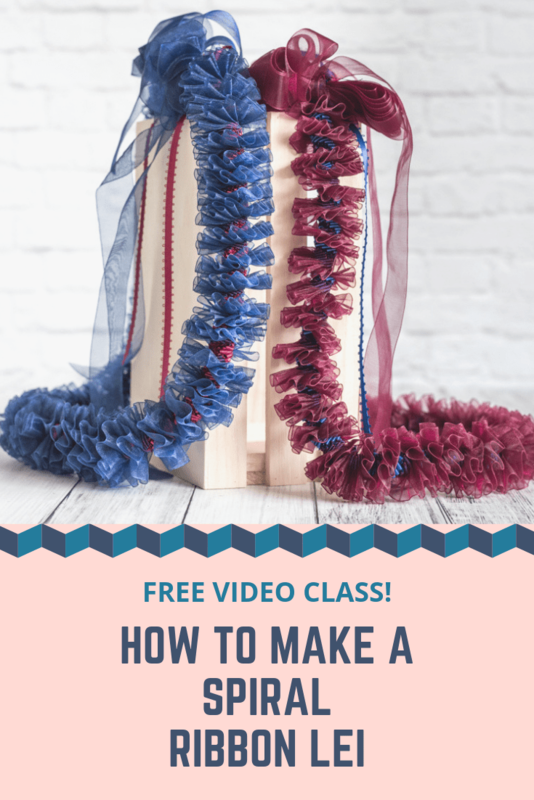 As long time readers may remember, my first Skillshare class showed you how to make a spiral Hawaiian ribbon lei. 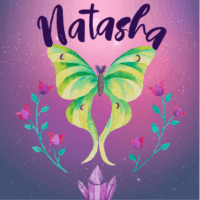 After some deliberation, I’ve decided to upload the class to YouTube and share it here on The Artisan Life absolutely for free for all comers. Although I provided a free enrollment link for Skillshare, most people who stopped by the relevant post didn’t want to create yet another login on another site (and I don’t blame them!). I absolutely love teaching and don’t really see the point in having a ribbon lei tutorial class posted where no one can see it! That’s why I’m sharing the spiral Hawaiian ribbon lei video tutorial class here today. If you want to help support my work, please use this affiliate link to enroll in a free Skillshare premium trial and learn to your heart’s content for two months! People often wonder who can wear a lei. The answer is…anyone! Lei are frequently used to celebrate special occasions, like weddings, graduations, birthdays, sporting events, meeting someone at the airport, or even just a night out with friends. 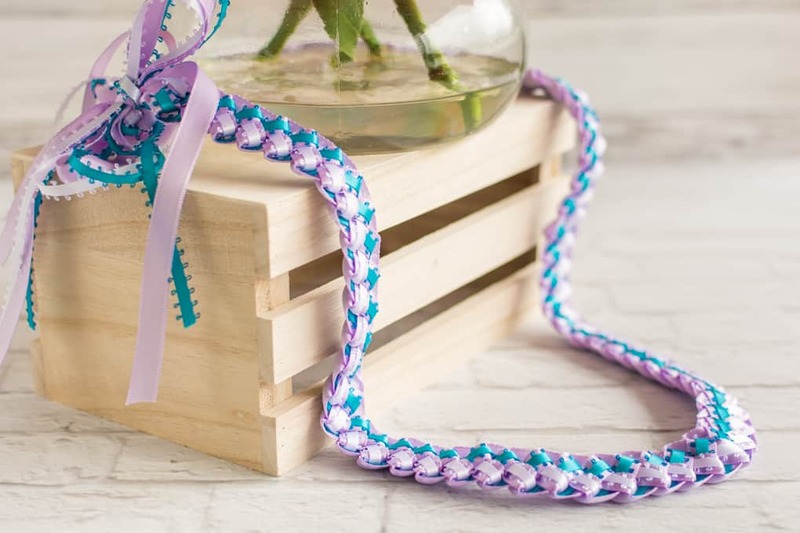 I’ve noticed over the years that most people looking for ribbon lei tutorials are either interested in graduation lei or making lei for military homecomings. 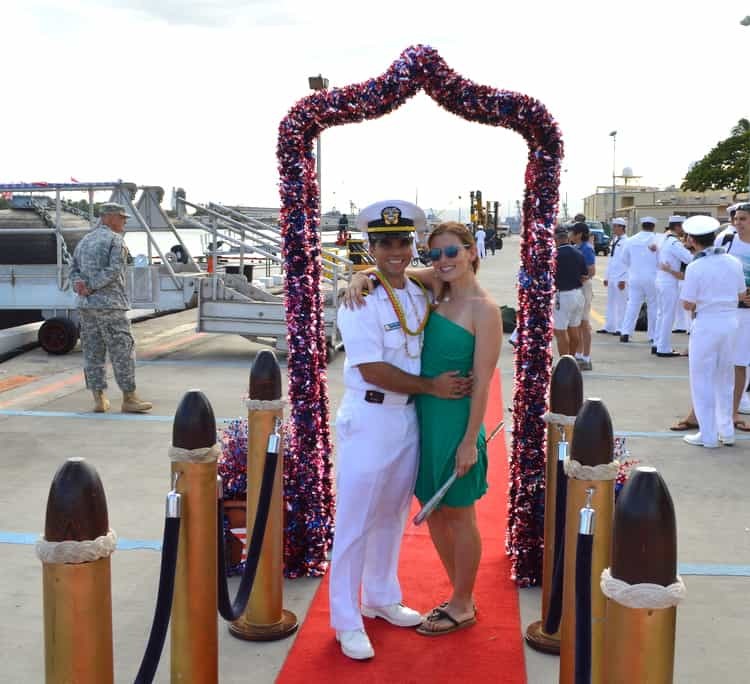 During my husband’s second deployment, the FRG made lei in the boat’s colors for each returning sailor. It’s also popular to use school colors for a graduation lei. Lei are usually presented by placing the lei around the recipient’s neck and giving them a kiss on the cheek or a warm hug. Technically, lei are meant to be worn so that they drape evenly over the wearer’s shoulders on the front and the back, not pulled entirely to the front like a necklace. Honestly, most of the time I’ve seen people just wearing them like a necklace, though, so don’t stress it too hard unless it’s a truly special event! 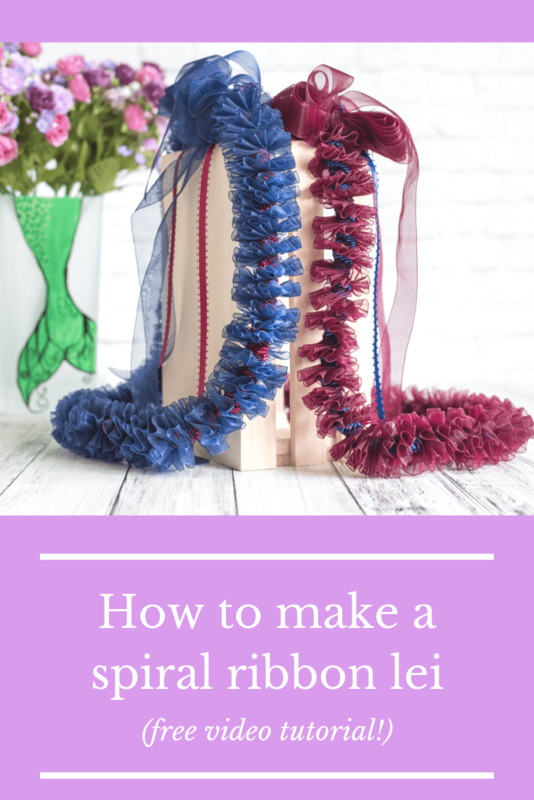 You only need about $5 worth of supplies to make a spiral ribbon lei! ~25 yards of 5/8″ of 1″ ribbon without a stiff or wired edge. I used an organza ribbon. You can grab a PDF of the supplies list right here if you prefer to print things out! This spiral lei is easier to make than the one shown in this earlier tutorial without video because it eliminates the need to measure! Because there’s no measuring, the narrow picot ribbon is essential. You “measure” by counting picots instead of measuring and marking with a ruler. If you can’t find picot or don’t want to use it, please visit the earlier tutorial. Although these videos are on YouTube, I’ve kept them in a private play list to avoid confusing my YT followers because they’re primarily there for the free yoga videos! You can either watch all of the class sections here in this post, or you can use the links in the YouTube video descriptions to navigate. You won’t find the lei tutorial videos if you browse my YT profile! These are the general steps for beginning and working on the lei. Please watch the video for a more in-depth tutorial and to see exactly how to make your lei! Begin by cutting off about 3 yards of your wider ribbon and keep it in reserve for a bow. If you don’t want to make a big bow, you can skip this step! Thread your needle, but don’t cut the thread off the spool! You’ll be making the lei with ribbon as it comes off the spool. If you have a 25 yard spool, it will be the perfect length for a lei! If your ribbon is longer, then just keep working until your lei is about a yard long, or however long you’d like. To get started, line your picot ribbon up along the edge of the larger ribbon. Move about 1-1.5 feet in, then insert the needle in the center of the picot ribbon in line with one of the picots. Count three picots over and insert the needle to make a long running stick. Continue counting, 1-2-3, stitch, 1-2-3, stitch. By counting picots you eliminate the need to pre-measure and mark! After you have a few stitches made, start scrunching up your ribbon. Hold on to the spool end of the ribbon & thread, bunch everything up and then use the clothespin to hold everything in place. Make sure not to catch the thread because you’ll need to keep pulling it through. Again, please watch the video to see what I mean! Continue making stitches and then scrunching them up every few stitches, but don’t worry about forming the spiral yet. You’ll need to pull thread through and that becomes more difficult as the ribbon spirals! In this video, I show you what to do when your thread gets shorter, how to pull more thread through your lei, what to do if there’s a break in your ribbon, and how to handle a knot in your thread. In this video I show you how to make an optional, super simple bow to decorate your lei. This video’s title is pretty self-explanatory. It’s where I show you how to finish off your spiral ribbon lei and add that easy poofy bow from the previous video! If you found this class helpful, please consider supporting my work by signing up for a free two month trial of Skillshare. You’ll have access to all Skillshare Premium classes for free, not just the classes I’ve created! Plus I’ll receive a small commission at absolutely no cost to you. 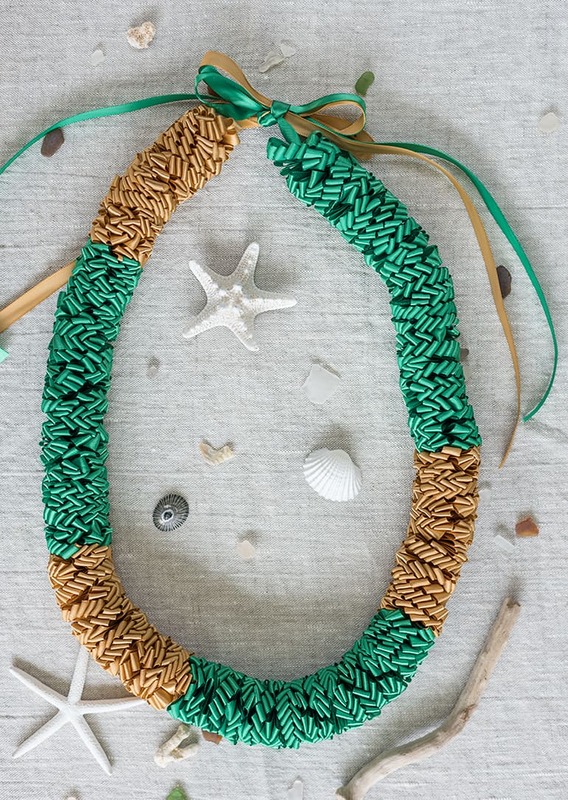 I have another Hawaiian lei class on Skillshare – How to make a Loopy Ribbon Lei. It takes even longer to make than this one but, man, it’s pretty! 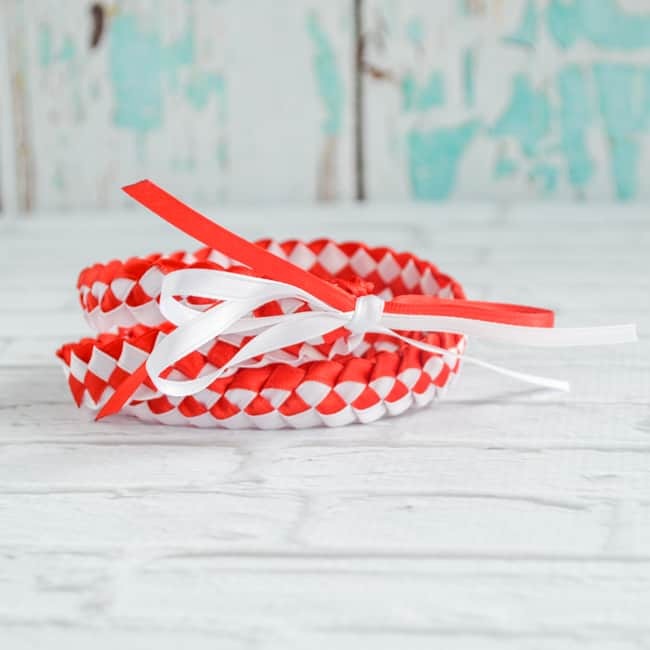 I truly hope you’ve enjoyed learning how to make a spiral ribbon lei with this video tutorial! If you have any questions about the process, please let me know and I’ll do my best to answer. I’m also happy to know about any lei tutorial requests you may have! 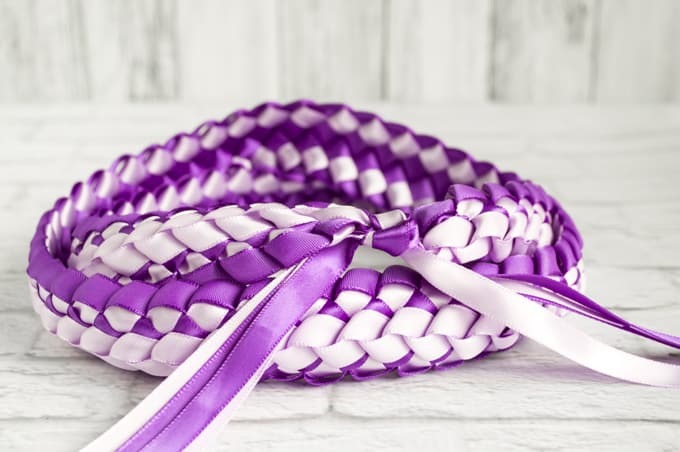 I’m thinking of doing a really complex ribbon lei tutorial for next year’s graduation season, but I’ve also toyed with the idea of sharing a crochet or knit lei tutorial. Are there any particular lei you’d like to see tutorials for in the future? Don’t stop here! Keep on crafting with more tutorials.